Jaléo (hah-LAY-oh) is a Spanish noun that means "uproar." In Flamenco, jaléo is an important part of the relationship between the performers and between the performers and audience. 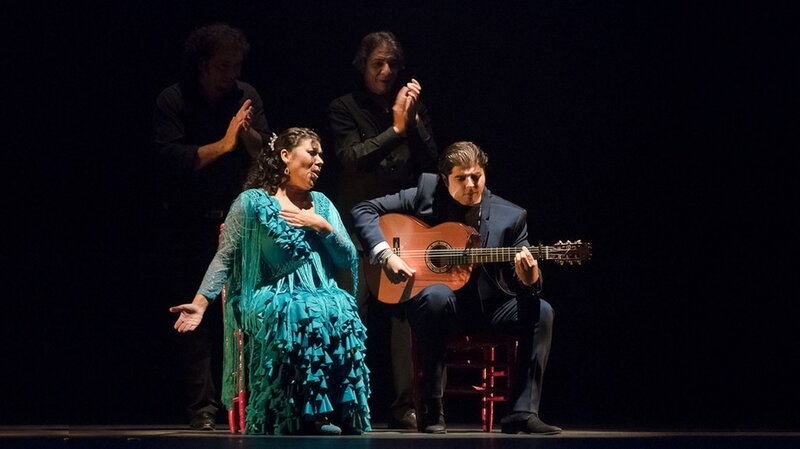 In this country, most audiences sit quietly through a performance (Flamenco or otherwise) and then clap and shout "bravo"
at the conclusion of the performance. 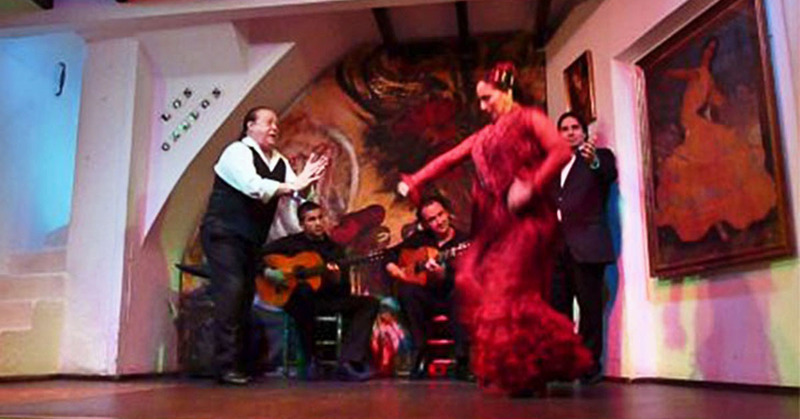 In a Flamenco performance, it is customary to shout your bravos during the performance, clapping and becoming part of the show while it is going on. When the performance is over, it's just over. No clapping, no bravos. Why? Because Flamenco (as opposed to theatrical Flamenco) is really not a performance, it's a communal activity connecting performers and audience. Everyone in the room is a participant, an unusual concept for many audiences. So often I see Flamenco dancers executing extraordinarily complex and fast-as-lightning footwork patterns, whipping their arms about in a frenzy, their wet hair clinging to their faces, chests heaving from exertion, jackets being tossed aside, but when I see their faces, look at their eyes, too often I see... nothing. I see no spirit, no emotion, no connection of their heart to their audience and, worse, no connection of their heart to themselves. What I do see is an exhibition, a proud display of their technique. A display designed to wow the audience with their technical expertise. Flamenco dance is not dancing steps to music; it is dancing from your heart within a rhythm structure, using Flamenco technique and being able to communicate non-verbally in a manner that a Flamenco guitarist can accompany you -- follow you not lead you. A proficient dancer knows the rhythms, a proficient guitarist knows the rhythms, and mostly that is all that is needed. The dancer knows the rhythms and leads; the guitarist knows the rhythms and follows. Period. There really is not much need for rehearsal, if any. The dancer does not follow the guitarist, the guitarist follows the dancer. Floreo (floor-A-oh) in Spanish means "to flower". 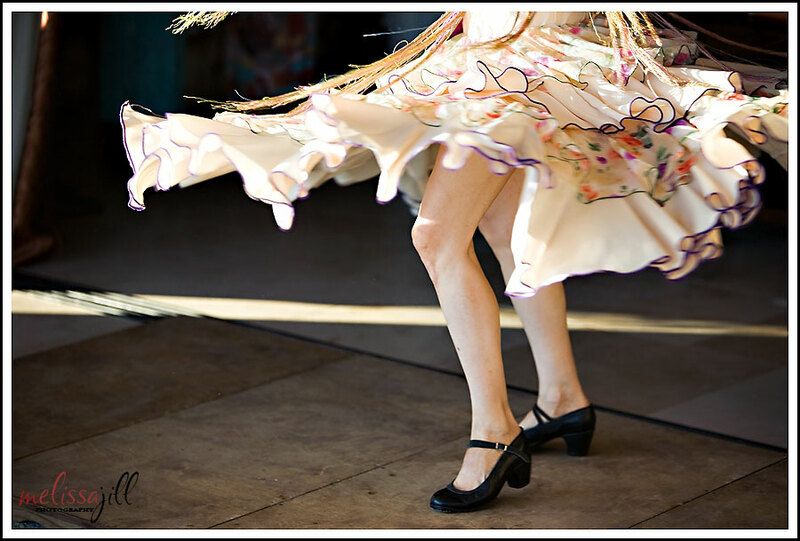 In Flamenco dance, floreo means handwork -- the movement a dancer makes with his or her hands while dancing. Both men and women do floreo, but it looks quite different on women than on men. Men have very strong movement of the hands with minimal movement of the fingers while women have very graceful movement of both the hands and fingers. For women, floreo and braceo (arm movement) are some of the most beautiful parts of Flamenco dance technique.